The philosophical graffiti above comes from a remark during my spring Bioethics course. We were talking about abortion (I believe) and a student was a bit concerned that she would not be able to articulate exactly what was on her mind. In response, these words came out of my mouth. They get to, I think, the ideal of what I hope for in a course on Ethics or Religious Studies. On the first day of each class, I go through a distinction with students. I tell them a bit about Socrates (we often end up reading the “Allegory of the Cave” early in my courses) and I tell them about he distinguished himself from other teachers of his time. We talk about the Oracle at Delphi, and Socratic ignorance, but I really emphasize that for Socrates, philosophical inquiry and conversation were about one vital matter: seeking the truth. Martha Nussbaum’s Cultivating Humanity has a lovely epigram from the Republic: “It is no chance matter we are discussing, but how one should live.” This class, I tell students, can become an environment where questions – real questions – are taken seriously: Who am I? What should I do? Why is there suffering? Why be moral? However, I also tell them about the shadow side of such inquiry, as represented by the Sophists. This group of teachers also flourished in ancient Athens. Instead of pursuing truth, however, they taught methods for victory: how to win in arguments using all sorts of different methods, including flattery, manipulative speech, and the like. They represent another possible outcome of a course devoted to philosophical inquiry: we come to class so convinced of the truth and rightness of our own positions that we seek only to validate them publicly, in the company of others. We bludgeon others with our own ideas instead of listening to the ideas and perspectives of our peers. And in the process, class becomes more competitive than collaborative: rather than working together on a shared goal of deeper understanding, we work only as individuals, pursuing the victory of our already-held positions. I often pause here to make a few points clear. Students can – and ideally will – bring strong convictions to class. Of course. But they (and I) must also be willing to examine those ideas, to question and apply scrutiny not just to those ideas that might seem foreign to us (a caste system, or ideas of reincarnation) but also to those that we might take for granted (the moral supremacy of liberalism, say, or the idea that there is only matter in the universe). To put the matter a bit differently, we approach texts and each other with a goal of understanding as opposed to a goal of critique: a hermeneutics of generosity as opposed to a hermeneutics of suspicion. Approaching the course with these ideals creates habits of citizenship and philosophical engagement that make us more careful listeners and thinkers – surely a worthy outcome of any effort at education. These are, of course, ideals. But they are ones that I take seriously, and that I hope help to shape our class discussions. Some classes don’t quite realize these ideals. 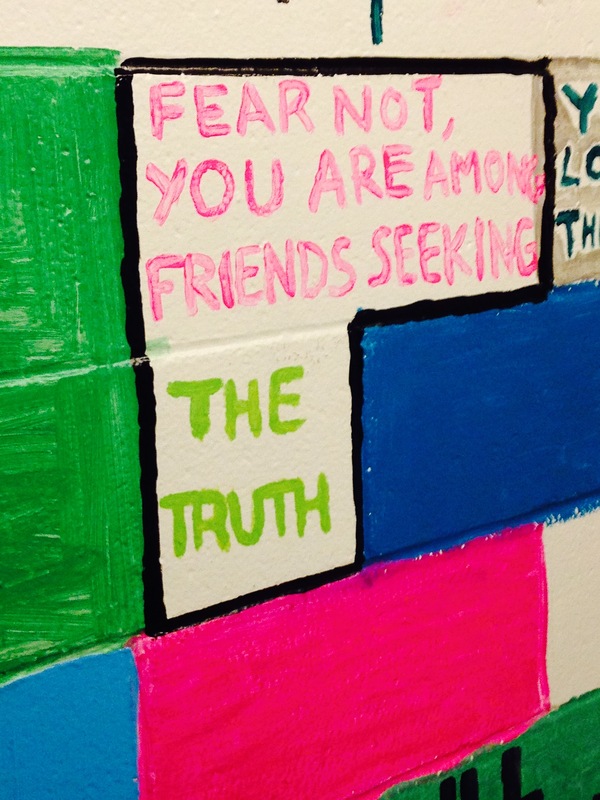 But others, like the one in which this comment tumbled out, really seem to embrace this ethos, and even look for a place at school to enshrine it for a year (until the next senior class comes along and paints over it…). This entry was posted in Teaching and tagged Bioethics, discussion, Martha Nussbaum, pedagogy, Socrates, Sophists, teaching, truth by teachingasianreligions. Bookmark the permalink.